Money for Good 2015, the third report in the Money for Good series, was published September 1, 2015. 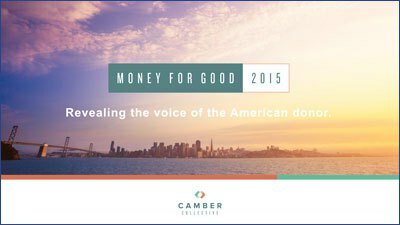 Hope Neighbor of Camber Collective, one of the report’s authors, will lead a webinar on what Money for Good 2015 ($FG 2015) means for fundraisers on May 11—and shares some early learnings here. Alison Carlman of GlobalGiving pitches in, sharing reflections on the work that GlobalGiving has done with Camber to refine the $FG donor segmentation tool, available for free download. Recently, GuideStar’s editorial director spoke with Hope and Alison about Money for Good 2015. Money for Good 2015 is out today, and, like its two predecessors, it offers plenty of food for thought. Published by the Camber Collective (the result of the merger between Hope Consulting and SwitchPoint LLC), Money for Good 2015 examines donors’ motives for charitable giving and what they mean for philanthropy overall. The following is a guest post by David Hartstein, a partner at Wired Impact, a web design company that focuses on nonprofit website design. The following is a guest post by Greg Ulrich, co-author of the new guidebook, More Money for More Good . For years, people have tried to make philanthropy more effective. And for years, little progress has been made. Through our research, Money for Good I& Money for Good II, we now know that only 1/3 of donations by individual donors are researched, and among those, only 5 out of 100 donations are researched specifically to identify the “best” charity.